Whenever I walk the Tallertown road, the ghosts rise up around me. There is, to begin with, the ghost of the town itself for in these days no one seems to be sure if the village, now only a scattering of weather black houses, was Tallertown or Tylertown. Up to now, or not long ago, it had been Tylertown to me because. old men like Constant Ford and Vill and Lonzo Nichols had associated it with a long-gone family of Tylers. More recently my friends in Hermann, or Hermantown, where they used to make glass along the Mullica River and beyond Charcoal Point, from where cordwood was shipped to heat pre-coal New York, began calling it Tallertown or Tallowtown, because this was where quantities of “tallow trees” grew. Here, then, and within the shadow of Hanover Furnace now swallowd up by Fort Dix, early Jerseyans knew how to boil what they called “tallow trees” in order to obtain a wax from which they fashioned their rude candles. I must not complain, however, for they still use the next best appropriate illumination – oil lamps. None has known that intruder, electricity, which recently spoiled the quaint interior of the ancient Green Bank Church. For my part, I thought that I had finished with Tylertown or Tallertown, as the case may be. I went that way to Bulltown, another glass kiln, long ago, and, even in an earlier day, I traveled with Warner Hargrove along the brushy path which still is dignified with the name, Washington Turnpike. This is the road, straight as a ramrod from Batsto to Harrisville, past the cellar-holes of a little known Washington, N. J., that Joseph Wharton built with his own money across what he expected to be a Philadelphia water-shed. It was a letter from Hoills Koster, probably written so painstakingly by the light of another oil lamp, that called me back – this time to the weird tune of phantom fiddles. 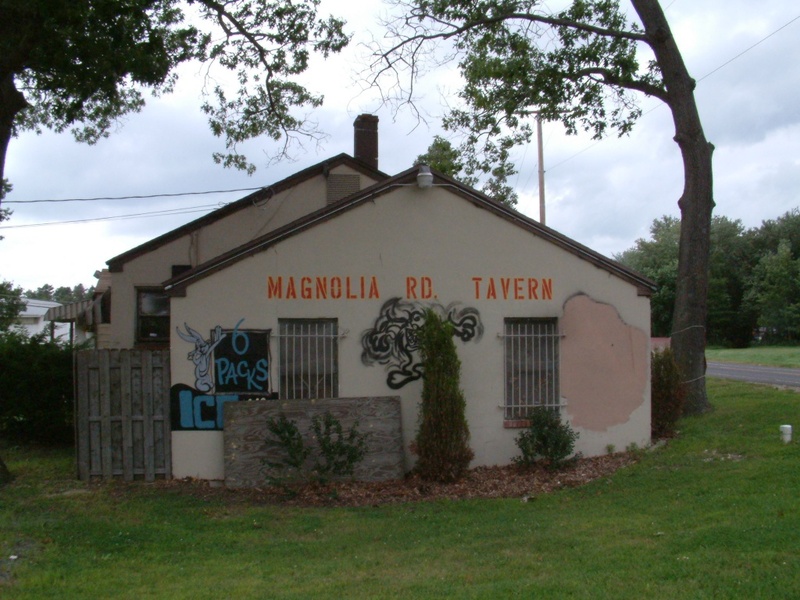 Many years ago, I have been told, the three taverns on the old Quaker road – Quaker Bridge Tavern, the Mount Tavern and Washington Tavern – held party nights once a week. One week the Mount will hold a party, the next the Washington Tavern took its turn, and so on. Folk from miles around attended and the region produced some particularly fine fiddlers, we are told. Their reputation, at any rate, seems to have survived a hundred years or more, Naturally, so have their ghosts. Johnnie Johnson, now at Anchorage, Alaska, has been concerning himself with some of the old names along the Tallertown road – and we have exchanged a deal of correspondence. We have been trying to find out, for instance, why the king snake is known in the Pine Barrens here as a “wamper.” Naturalists had supposed that this word was a corruption of “swamper” but we felt this theory was not too strong. We soon had string of words meaning to undulate, etc., from the Scotch, Dutch, old English and other sources. We also remembered the wampum snake but feel that we have as yet proved nothing. Let me break in here to say that in company with Will Nichols and Hollis we have located the stump behind which, the legends say, an unidentified ghost is known to lurk at certain times of the year. It isn’t far beyond Tallertown and, at least by day, it appears far from extraordinary. 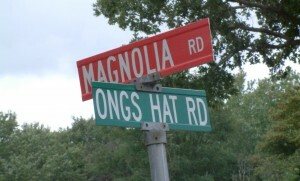 However, it was the late Bill Birdsall, brother-in-law of Will Nichols, who said that on at least one occasion a cold hand touched the back of his neck as he passed that way. “And Bill wasn’t given to believing in that sort of thing.” Will assured me. “What,” I demanded of Hollis, as we hurried along, “was a money spear?” I had concluded that it must be some new variation of a divining rod but Hollis told me I was wrong. It was to all appearance just another pointed stick, he said. Whatever powers there were seemed to belong to Kate Ford although whether her poking about in the Jersey “desarts” ever resulted in the discovery of buried treasure is something I have not found out. It was at this point that Hollis, in the midst of an impromptu lecture on the difference between two-leaved pine, stood still as if to listen. I thought that he was about to reveal that his sensitive ears had just picked up the wavering whine confected of rosined horsehair on catgut. But it was something more important than that. I recalled the episode and Hollis merely smiled. “As long as you are on the subject of God,” he said, “you might take note that over on the Tuckahoe River people used to answer a query as to where they might be from with ‘Tuckahoe, God bless you!’ Some say that when the herring were up and the Tuckahoe folks in no mood to tarry another word, probably profane, was substituted for bless’ . . .
“Of course,” Hollis Koster continued in his letter, “you have heard of the old statement that when the herring are about, a dweller along the Mullica River cannot remove his shirt. The explanation is, I suppose, that while the fish are in the river, every moment must be spent in catching them. As for the eating of herring, Mullica men always insist that there is but one satisfactory way in which to handle the numerous fine bones for which the species is celebrated – to forget that bones are any impediment to eating, and swallow! “But back to our fiddlers. Asie Ford had been fiddling at the Mount Tavern one night and then at a very late hour took the ‘lang Scotch miles’ afoot down the old Quaker road toward Tallertown. Today this country is a pine barren wasteland without a dwelling for miles. Then Asa, on his way, after bidding his host, Jonathan Cramer, good-night, would have passed what was known as Noah’s Ark – this was where Noah Sooy lived alone, after separation from his wife, who in turn lived alone some distance away in what we call Polly Sooy Field. “Asie arrived home with his face scratched and bleeding and in a generally disheveled condition. Perhaps some said, ‘Served him right to be caught on a lonely road at such an unholy hour!’ But Asie had been through a strange adventure, perhaps the natural sequel of a boast he must have made during the evening. He had said he could out-fiddle the devil any time he liked. “Two or three miles southeast of the Mount, a stranger had stepped into the road, accosting Asie with words of anger. He then whipped out a violin and challenged Asie to a fiddling match right then and there. A pine log lay by the side of the road and the two sat down and commenced fiddling. “Before long the stranger was puffing and blowing. Asie glanced at him, and in a moment deeply regretted the idle boast he had made during the evening. He had not intended to be so drawn into a contest with Old Nick himself. There was little to be done. Asie simply fiddled more furiously. Soon he noticed that the stranger had stopped his fiddling and was listening to his opponent. Asia then stopped, too. Surely you can see how Hollis’s letter spilled over with unspoken invitations, I had expected to go down that way a little later when more than the shad-bush would be blooming and when I could visit with Bill Birdsall’s widow, now in her 70’s, and Abbie (Mrs. Will) Nichols, 93, in what I like to call my unofficial parish. Aunt Mary Birdsall had been ill all winter, they said, and Abbie hadn’t spoken plainly since she suffered a stroke. Now, looking back, although I will freely admit that it was the string of stories linked with the Tallertown road, especially the tale of the devilish fiddling match, that drew me Down Country, my own compensation lies in having seen these old friends. I can never understand why people far up fading country roads are allowed to grow lonely when a call means so much to them. First time I went to the Birdsall’s you may remember, their house had burned down a few days before. Even so, the fact that nearly everything but their lives was lost failed to keep Will and ‘Lonzo home on the first day of deer season. On the way to the Nichols’s we passed what Hollis called Molasses Hill. There’s no molasses, of course, and the hill is equally elusive now that the land back of Hermantown is so grown over. Beyond the graved hole is where, Hollis Koster says, Mary Tunis met a bear. Mary was in such a hurry to get away that the lid of her kettle slipped off and molasses dripped all over the ground. The bear, whose attention had been devoted to an ant hill until Mary’s approach, quickly switched to the molasses with evident delight. 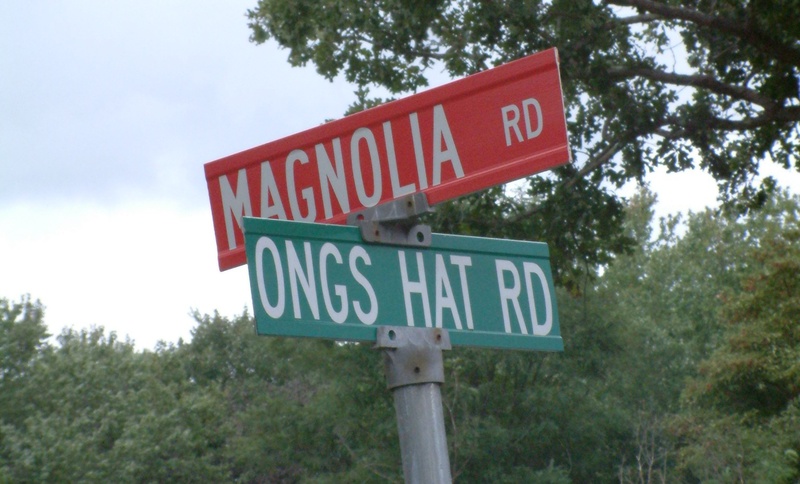 “And just who,” I asked Hollis, “was Mary Tunis?” Perhaps, I thought, her ghost was somewhere about this Tallertown road. It was not until I sat down beside Abbie Nichols’ making believe I could understand all the things she was trying to tell me, that recalled that she Is Hazleton Birdsall’s daughter and that “Haze” who taught Sunday School in the old one-room school that has been turned into a delightful little house, was my favorite Down Jersey carpenter. “Haze,” whose name will be ever remembered In Haze’s Crossway not far down the Tallertown road, used to build houses for the dead as well as for the living. Nothing could interrupt his careful building of a house except word that someone had died. Then he quickly brought his work to a halt, climbed down his ladder and went home to his barn to ascertain if the corpse would fit one of the “boxes” he had fashioned and put by in storage. His barn, they say, concealed coffins in all sizes, always of the best wood and Birdsall workmanship. If the measurements of the deceased required a special “fit” Hazieton’s plans would be interrupted still further. The point is, as Will Nichols admitted when Mrs. Nichols couldn’t, In spite of her smiling and chattering agreement with all I said, that from the moment someone died, “Haze” Birdsall took charge. He prepared the body for burial on what he called a “cooling board” and he used pioneer ways to keep the body in good state until the funeral. In Hazelton Birdsall’s day even preachers were hard to find when wanted and, when a reasonable wait had been undertaken, “Haze” suggested that, in addition to driving his homemade hearse to the cemetery, the bereaved might like to have him preach the funeral sermon at the end of a service which, from all accounts, he conducted very well. Yes, sweet Abbie, who in spite of the paralysis which has tied her tongue appears far younger than 93, remembered all that. A tear betrayed the fact that she knew all that I had said was part of familiar though fading picture. Will broke in to remember the time Al Nichols lived “up to the Housen place” and Ephraim Sooy’s horse “got scared” as he passed the haunted stump. Minutes later I had persuaded Will to desert his house long enough to travel up the Tallertown road further than he had been, by his own admission, In the last two years, “There’s the stump,” he cried, as we came upon it. “More’s rotted off since I was here but there she be, sure enough. Eph’s horse got scared when something white came out from behind the shaft of it and Eph swore neither he nor the horse knew what it was. We had moved on to what once was Washington, or Washington Field, site of the parties Hollis described as well as the Inn where “Joe” Mulliner, the Refugee, was captured. Although I have been there many times through the years, I did not know there was ever as much of a town as Will described, “Place had its own school,” he said. “Tom Campinello was one of the last schoolmasters.” Inasmuch as Tom served as godfather for Hollis Koster, I have concluded there was a settlement in what today is a mere clearing in the heart of the pine woods much later than anyone ‘has revealed. The cellar holes are all that remain of houses still standing as late as the 1880’s, perhaps, probably the victims of a forest fire that swept all such century-old relics before it. “People say the soil is poor,” said Will. “Not so at all. Soil’s as good as any around. I remember when this clearing was a corn field and when there were farms all around. Shreve Wells ran the Mount Tavern, then, and there was a town as big as any around here. Here where the roads meet, cutting into what was the farm, people were happy and – ” What ‘Will wanted to say was that Washington, N. J. – far from the remaining Washington in Warren County – was self-sufficient. Tallertown may have dropped from sight, Quaker Bridge may be less than an empty crossroads, and Harrisville may be but the crumbling ruins of the paper plant I’ve told you about, but there were many years in which whole families lived and moved and had their being in all of them. It was, I can assure you, a shivery journey, even though I encountered neither Old Nick nor phantom fiddlers on the Tallertown road. The ghost arose from the shadows all around us, however, and it was something of a relief to return to Hermantown and see something more tangible, a violin they say was by the fiddling Fords. The instrument was proudly displayed by Nick – for Nicodemus – Ford who swore, as country musicians usually do, that hero was a true Stradivarlus. “Play it,” Nick suggested. Although I was trained, long ago, to nudge Fritz Krelsler from his throne, I demurred, pointing out that the bow that was proffered had no hair. “Don’t need none,” Nick declared. “Hair on bows went out with horses. Fiddlers down this away never seemed to mind. When a tune was wanted they rosined the wood and played. See? Like this!” Without further preliminary, a full-bodied tune emerged, melodic in spite of the scratches required, and rhythmic as well. I knew at once that the limbs of trees, rubbed together by the wind, could never make a sound like this and that the Devil, who came upon Asie Ford In the long dark of the road toward home, could have welted Asie’s face with ease – and with such a hairless stick. It was back in 1968, that the Wells Mills Frog Farm first saw the light of day. Even the locals were unaware of the giant 10-, 20-pound, and even larger, frogs that were being dredged up at night, from a secret Wells Mills Road lake, for shipment the following morning to the Fulton Fish Market in New York City. The record catch was a 27-pounder affectionately named Tom, who was kept as a pet, but on a chain. At this point, for the benefit of you skeptics who may be thinking, “Sounds like another one of those Baron Munchausen tales that those Pineys are always making up,” well, perhaps you’re right – at least in regards to this particular tale. However, at the time this story got started, there was a believer, a disc jockey known to the farmers only as “Cowboy Joe.” He had just embarked on a Saturday night, 6 p.m. to midnight, country western music and talk show, on the then new FM station WOBM in Berkeley Township. Cowboy Joe was sharp, and he had talent. His show was really great, so they say. Apparently Joe was inspired by the homey, Jersey bayshore area atmosphere, so different from that of his regular station up north in Brooklyn. On the other hand, Cowboy Joe was a city boy. He knew from nothing when it came to bayfolk, Pineys and such. That’s how come he bit the hook, line and pork rind when he first met and became friendly with four local guys – Cliff Oakley and Toby Spatt, both of Manahawkin; Bill Sneddon of Waretown, and Bob Kruysman, known locally as Kaptain Krunch of the same name bait and tackle shop located on Route 9 in Waretown. It all started when Sneddon and Kruysman checked in at the recently opened radio station. Both men were police officers at that time. A pot of coffee was kept going in the office for visitors. This was a welcome treat for the officers since there was no other place for coffee on Route 9 back then. There they met the new announcer and got to gabbing. They were asked what it was like down here, and whether there were any things of special interest in towns like Waretown. “Frog farm?” exclaimed Cowboy Joe. The two men, with serious cop demeanor, but as a joke, began to embellish on the frog farm story. Neither could later recall just what made them do it. Oakley and Spatt were then brought into the growing conspiracy. The two schemed and they thought up the idea of buying a pair of choice frog legs from Clayton’s Restaurant on Route 70 in Barnegat. They wrapped the purchase in tinfoil and fastened a bow on the package. This they then delivered to Joe along with a bottle of fancy French wine. The boys were invited into the broadcast room. Oakley, who loved good western music! asked if more Eddie Arnold platters could be played. Pleased with his gift, Joe agreed. More details about the farm were sought. In unison, they said, “Sure.” Then each tried to outdo the other to dream up some of the more unusual frog farm “facts.” It went something like this. “Oh! Why is that?” asked Joe. The D.J never did learn of the hoax that had been played on him. But then again, who can know for sure whether or not the “Cowboy” wasn’t pulling a leg or two himself? Thereafter, Cowboy Joe would always play at least one, or even three or four, Eddie Arnold records on his show. With that, he would say, “How are all the guys doing at the Wells Mills Frog Farm?” Soon after, he had to return to his permanent job up north in Brooklyn. The 20th anniversary of the broadcast of the Wells Mills Frog Farm story on WOBM was celebrated at a reunion held in a backwoods cabin off Wells Mills Road (Route 532) in Waretown on a Saturday in 1988. Present were Oakley, Sneddon (now the police chief in Ocean Township) and Kruysman. Absent due to the frigid weather was Spatt. With snow in the cabin fireplace, who could blame him? The story was re-enacted, as it is at each frog farm reunion, amidst spasms of laughter. Somehow the story keeps growing, as Piney legends are wont to do. Thus ends the saga of the long-gone, Wells Mills Frog Farm. Or does it? Note: This page is from an article that appeared in the SandPaper, Wednesday, February 10, 1988 by Cornelius Hogenbirk. Cliff Oakley is now a Park Ranger at the Wells Mills County Park. 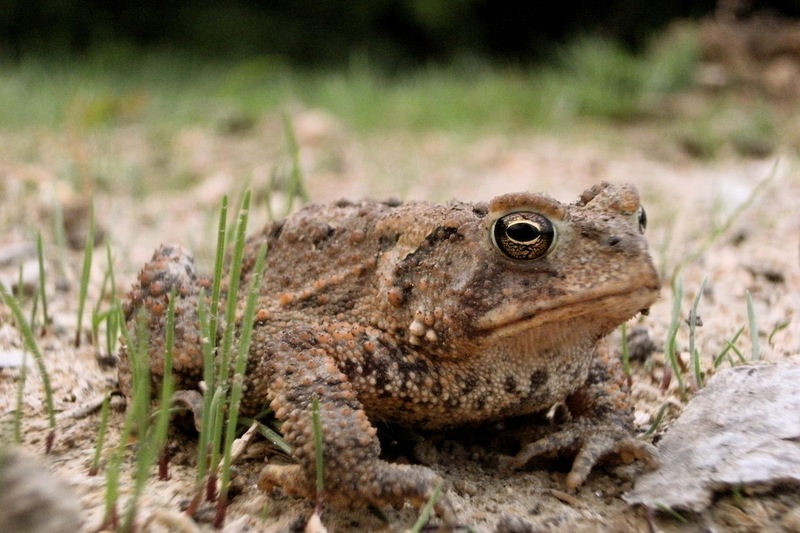 If you visit the park, look for him and ask him about the frog farm. It will make his day. Bob Kruysman sold his interests in Waretown and is now retired in Florida. Stretching from Toms River in Ocean County, to Cape May lies a tract of forest that has captivated people since pre-colonial times. Some of the first permanent settlements in North America were in the Delaware River area. Dutch, Swedes, Portuguese, and English settlers all found the area a harsh but profitable area to settle. In the early years of British Colonials, iron making towns sprang up, converting the local bog iron found in the cedar streams to a crude form of iron – pig iron. These foundries provided much needed ammunition for the American fight for freedom. But there is something else about these woods that makes it a place shunned by many. The Pine Barrens are truly a world cut off from the rest of society. Within the Pine’s stretches many strange things have happened. Paint Island Spring, a natural hot spring, has been said to cure many illnesses. A tree in Burlington County that a man was murdered in front of is perpetually green – as is a patch of grass in front of it. A huge forest of stunted pines lay nearly in the center of the forest – you could look from horizon to horizon and not see a tree bigger than four feet. And then there’s one thing that makes many of the locals dive for cover, when eerie screams ring out and cloven footprints appear in the ground – what many of the locals call the Leeds Devil, or to those outside of the pines, the Jersey Devil. The weather that usually accompanies supernatural events is the standard “dark and stormy night”? stuff. And indeed, this night was one of those nights. Leeds Point, where our story begins, is located on the Southern shore of the Great Bay in Burlington County. Leeds Point today is a small dot on the map, just a few houses that are used only seasonally. Leeds Point, back in pre-colonial days, was a larger community, located conveniently on the Mullica River and the Great Bay. Like any good folklore, the details of the Leeds Devil’s birth are shadowed by the mists of time. The most commonly accepted belief is that a lady known only as Mrs. Leeds (although many insist that her name was Mrs. Shourds) was blessed with 12 children. Upon finding out that she was pregnant with her 13th, she cried out, “May this one be the devil!”? Her wish was granted. The birth was normal, but accounts say that almost immediately, the infant began changing. It’s skin grew rough and scaly, it’s hands and feet elongated and grew hooves, it’s back sprouted a pair of bats wings and serpentine tail, and it’s face twisted and changed to have the face of a horse. Reeling about, it thrashed everyone in the room with it’s tail and flew up the chimney and off into the night. The devil began raiding local farms, feeding off of crops and livestock, it’s most favorite animal being chicken, which would either be missing when their owners would check them in the morning, or be found dead, for apparently no reason. 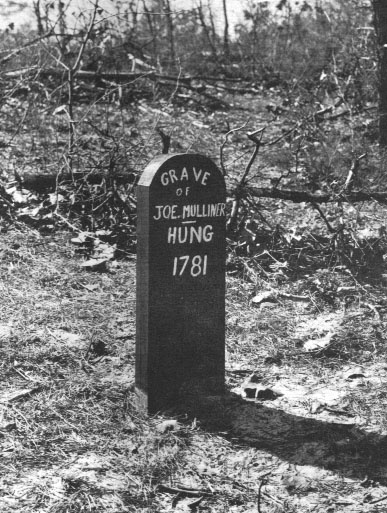 In 1740 one of the wandering missionaries that preached from town to town in the Pines exorcised him for 100 years. This may not have been effective, because the Devil was reported seen a few times between 1740 and 1840. Another theory is that Mrs. Leeds refused food to a wandering gypsy, and that the gypsy cursed her unborn child. Another version has it that someone other than Mrs. Leeds had the child – that a young woman was impregnated by a British soldier, and that the offspring was the Devil itself. The latter is probably just Revolutionary War propaganda, because in the eyes of colonials, the Redcoats were the devil themselves! It should be noted that the British had several campaigns against smugglers and pirates in the area, and that the disastrous Battle of Chestnut Creek was fought not far from Leeds Point. No matter what the variants on the legend, the basics are the same. It was man sized, with a forked tail, cloven hoofs, and the head of a horse. Sprouting from it’s back were two large leathery bat wings. It’s diet consisted of crops and livestock, but oddly enough, there are no reports of it every attacking a human. Many people believe the Devil to be a harbinger of doom. He has been spotted right before every major war, and legend has it that the Leeds Devil will perform some act of mischief on you if you hold evil thoughts. The Devil was also not alone in the lonely pines. He has been seen with the spirit of a pirate thought to be one of the infamous Captain Kidd’s crew, killed so that his spirit would guard the treasure. The Devil was also thought to be cavorting with a mermaid out to sea, and a beautiful white clad girl with radiant golden hair. Many people had hoped that the new century would see the end to the Jersey Devil. He had remained quiet since the late 1880’s, when he was last seen raiding sheep near the New York – New Jersey border. However, fear and panic struck Burlington county in the latter half of January, 1909 – and a new era of Devil sightings were about to begin. Saturday, January 16th was the first day that sightings started being reported. A lone sighting in Woodbury, NJ, and two in Bristol, PA started off the furor. The Woodbury sighting, reported by Thack Cozzens, was quick – he just saw the Devil crossing the road near the Woodbury Hotel. He described it as moving faster than an auto, with two spots of phosphorescence for eyes. In Bristol, one sighting was made by Patrolman James Sackville, later chief of the Bristol Police Department. He described the beast as being winged, but hopped like a bird, with features of a “peculiar animal.” It’s voice was like a terrible scream. The creature fled after Sackville started firing his service revolver. Immediately after, E. W. Minster, the postmaster of Bristol reported seeing the Devil flying across the Delaware River at two o’clock in the morning. More tracks appeared throughout Burlington and Gloucester counties. This time the descriptions varied. Some claimed the Devil to be the size of a dog, while others claimed it had antlers, and still others claimed it had three toes and was dog-like. The next sightings happened early Thursday morning, the 21st of January. It’s first stop was the Camden area, where it appeared to the Black Hawk Social Club at 1 a.m. It again frightened passengers on a trolley, circling above the tracks, hissing ominously. Fortunately, it kept with it’s pattern of not attacking humans, and was off into the night. The Devil then flew North to Trenton, where it made tracks in the park and several yards. The Devil also tried to enter the home of Trenton councilman E. P. Weeden, but was foiled by a locked door. Many residents elected not to venture outside of their homes until they were sure the threat of the monster was gone. So frightened were local residents that ministers noted an increased attendance at their churches. Many poultry farmers also reported missing large numbers of chickens. Further adding mystery to this, chickens were soon found dead with no markings on them. Farmers speculated either choking or fright. They all agreed on one thing – that the Jersey Devil was at the root of the problem. The monster didn’t limit it’s activities to New Jersey on Thursday, either. He was seen running up the Chester Pike in Leiperville, Pennsylvania running along on it’s hind legs faster than an automobile. This time the devil had skin like an alligator, and was about six feet tall. 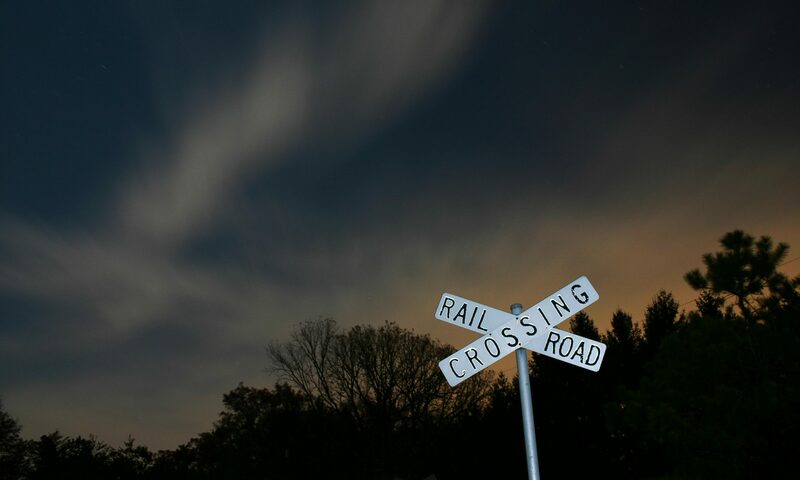 The Devil didn’t stay for long in Pennsylvania – William Wasso, a trackwalker for an electric railway company, watched as the Devil sniffed the center rail. He then saw the devil touch the rail with it’s tail, and explode, melting the track for twenty feet in either direction. Finding no trace of the creature, Wasso believed that it was dead. The Devil, however, has a history of being impervious to harm. Commodore Stephen Decatur, a captain in the Revolutionary Navy, was in Batsto testing some ordinance when he spied the Devil flying overhead. He ordered the cannon to be fired at it, but the shot passed right through the beast. It flew away unharmed. Friday saw the Devil back in Camden, observed by another policeman who described him to be a Jabberwock. By this time, the strain of the events of the week had taken their toll on the citizens of the area. Schools closed, and theater performances were canceled. The Devil was seen in Mount Holly, where William Cronk spied him from his window while eating his supper. The Devil was supposedly captured in the barn of C. C. Hilk in Pennsylvania. Two farmhands had locked him in there while he was riding on a wagon driven by one of the farmhands. Many curious people crossed the Delaware to see the beast, but in it’s usual fashion, it was nowhere to be found. The Jersey Devil was also not the only strange being to appear this Friday. Dan Possack of Millville had a struggle with “one of the strangest freaks of nature, or a monster straight from the bad place.”? While Dan was doing his chores he heard someone in the backyard walking around, calling out to him. When he turned around, he beheld a “monster beast-bird” about 18 feet high. The visitor demanded to know where the garbage can was, asking in perfectly good English. Dan, terrified, ran towards the barn, but the bird caught up with him. It wrapped it’s sinewy and red beak around Dan’s body. Dan began hitting it with a hatchet that he kept in his belt. He was astonished to see that he could chop splinters out of the body, much like he could out of wood. While he was chopping, the beast whispered something in Dan’s ear, and with a mighty blow, Dan set the hatchet square into the monster’s face. Out popped an eyeball, and with a scream of pain, the assailant took in a long breath, filled it’s body like a balloon, and floated into space.” Mass hysteria was certainly gripping the area. Many theories abound as to what the Leeds Devil was. Many were proposed in seriousness and in jest. Some believed that it was a prehistoric creature trapped in a submerged limestone cave. With plenty of air and a constant supply of food (fish) life could continue, separated from the rest of the modern world. The caves could have been opened by seismic activity. The Grand Banks area is known for earthquakes – could one of these opened up the cave that held the Devil? Nonetheless, the Jersey Devil in recent years has been quiet. He made a brief appearance in the 1950’s, and aroused many curious citizens to thrash around the bushes of Leeds Point. Maybe he’s silent now because his name has been commercialized. Countless bars and taverns bear his name, as well as a potent drink and a hockey team. Maybe the ever encroaching population that replaces more and more trees with modular homes and Sport Utility Vehicles has driven the devil farther and farther into the woods. Yet there are many people who refuse to go into the pines, be it daylight or night. The pines are an eerie place, physically separated from civilization only by a few miles, but lost in an age of its own. “Where stunted pines of burned over forest are revealed in darksome pools, the Jersey Devil lurks”? wrote the late New Jersey historian Henry Charlton Beck. Maybe he’s is right. Beck, Henry Charlton, Jersey Genesis: The Story of the Mullica River, Rutgers University Press, New Brunswick, 1963. McGloy, James & Miller, Ray Jr. The Jersey Devil Middle Atlantic Press, Wilmington, Delaware, 1976.